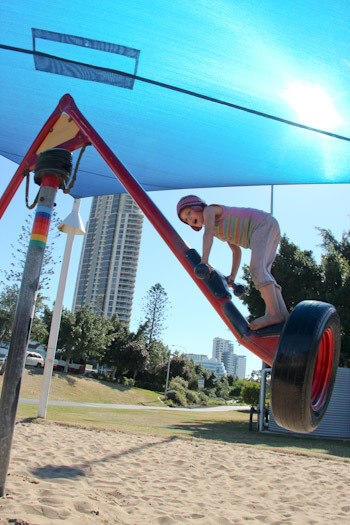 While we’re in the Gold Coast, we’re making the time to re-visit some of the best children’s attractions in town. 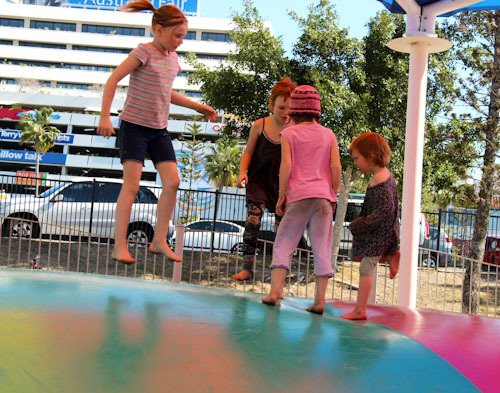 Despite all our playground experiences, the girls hadn’t experienced a bouncing pillow before this weekend, and after I parked the bus alongside the attraction at the popular Broadwater Parklands, it didn’t take long for the girls to spill out and run down to try it for themselves. 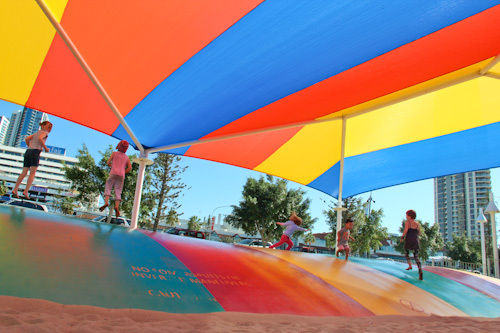 Under shade-sails, the bouncing pillow is surrounded by sand to provide a soft-fall surface for children who may jump off the edge. The joy of jumping together is in the unpredictability of the rebounding bounce. 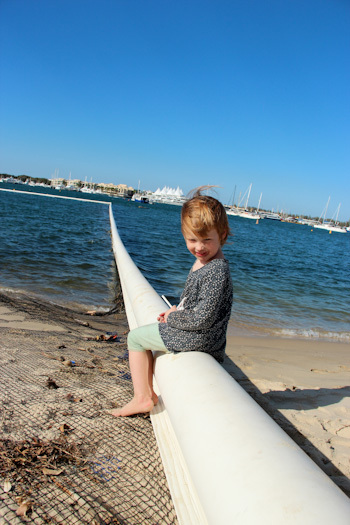 The Washington Waters Children’s Playground is only a small part of the great attraction of Southport’s Broadwater Parklands, but today it was enough for us. 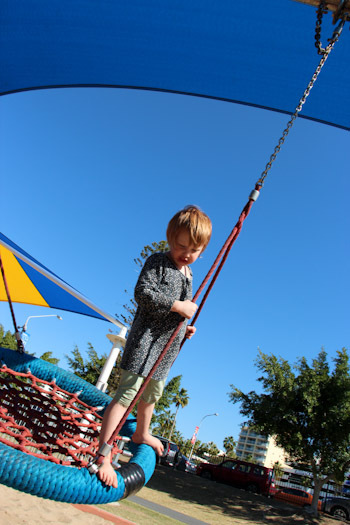 With the weather still a bit too chilly for a good play at the The Rockpools further to the north in the same leisure precinct, we stuck to the novelty of the bouncing pillow and its surrounding playground equipment. 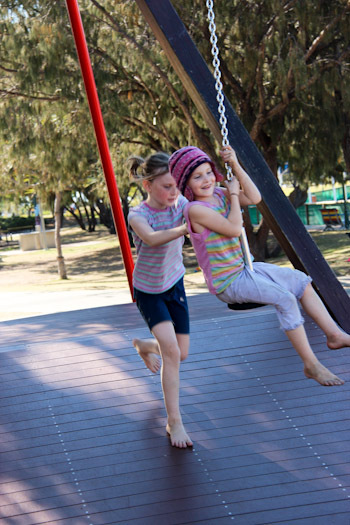 Once they figure out how to get two bodies on it at the same time, the rotating tire pendulum swing is a favourite with our kids. Calista alternates between being terrified and being delighted with the ride. Lana loves to swing and the dish makes it easy for others to push her or join her. 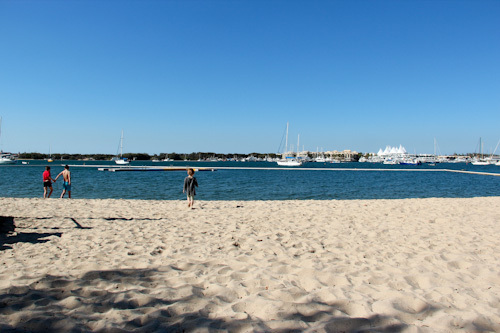 A small beach area is protected from sharks and boaters by a netted swimming enclosure. Although we're not interested in entering the water today, the prospect of treasures in the sand keeps luring Lana back to the beach. The tangible sight of the net attached to the floating barrier around the swimming enclosure gives Lana a lot to think about as she tries to imagine what is kept out of the water ... and why. Because we lived on the Gold Coat for a year and a half and remained settled in southeast Queensland for another ten years, many of these locations hold memories for me. One summer’s morning in 2009, David and I bundled our (then) three daughters into the car to drive to this beach for a swim at sunrise. At the height of summer in southeast Queensland, the days are so hot that a morning’s outing can end before 8am when the sun’s rays become unpleasant. 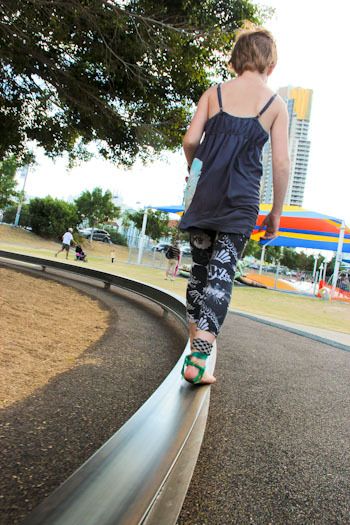 A single rail for pedal cars encircles another set of playground equipment and a flying fox. Calista receives a boost in her acceleration down the flying-fox line. 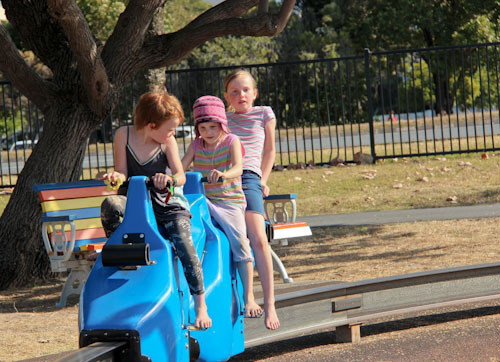 During the hours we spent at this playground, the girls tested all possible pedalling/riding configurations on the pedal cars. Sometimes other, stronger riders come up behind the girls and give them a free ride. 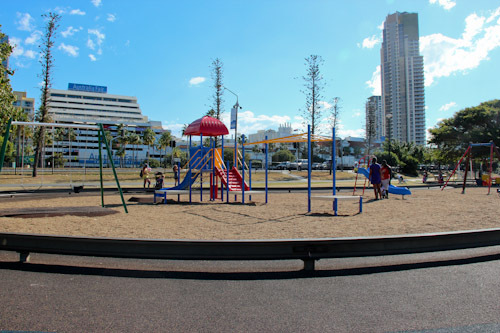 Because it’s a landmark with great access to parking, the newly-running tram network and shopping, the Broadwater playground is a natural place to meet up with friends for a big day out. Two other families joined us in the fun, and — while I made cups of tea for the parents with the kitchen facilities in our bus — we watched our collective brood explore all the equipment. 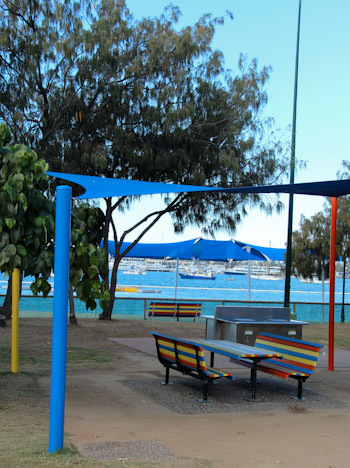 Colourful picnic benches and tables are protected from the harsh sun by shade-sails, and free electric barbecues attract patrons to the park year-round. 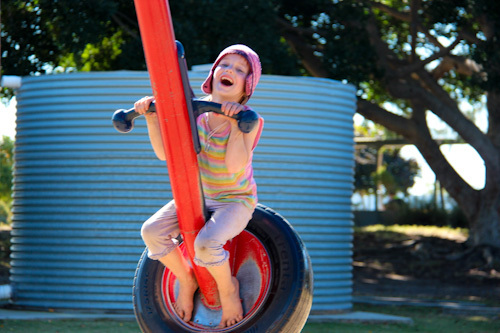 Sometimes the most fun comes from improvising games on the playground equipment that changes its purpose altogether. 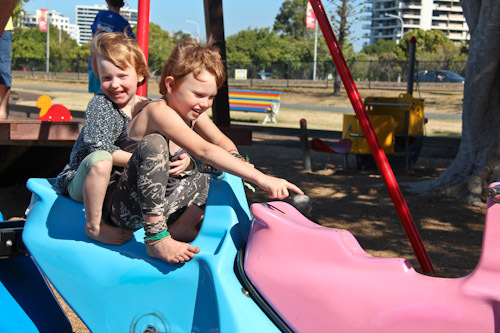 The Broadwater playground can be very busy, so it’s wise to choose non-peak times to park and settle in. The bouncing pillow is open from 8am to 5pm, with a natural lull in its use around nap-time in the early afternoon. Other out-of-towners like us can easily cross the road to the big shopping centre to buy food and snacks, and if you’re coming on a hot day, don’t forget to explore The Rockpools further north in the parkland. Oh! You find such fun playgrounds. You inspire me to find new ones for our grandkids. But Papa is stuck in a rut with the (really nice) one in our downtown.